A leafy herb, the garland chrysanthemum is one of the few annual plants in its genus. 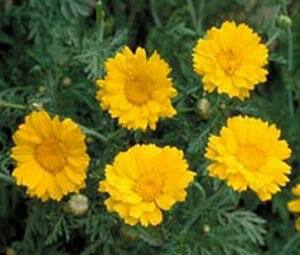 It has yellow ray florets grouped in small flower heads and aromatic, bipinnately lobed leaves. The plant is rich in minerals and vitamins with potassium concentrations at 610 mg/100 g and carotene at 3.4 g/100 g in edible portions.